The functions of National Institute of Occupational Safety and Health (NIOSH) are to provide training, consultation services, disseminate information and conduct researches in the field of occupational safety and health (OSH). As one of NIOSH core functions, information dissemination activities play a vital role in enhancing OSH awareness among industries, students and public as a whole. Our nation's commitment to occupational safety and health at the workplace is reflected through the enactment of the Occupational Safety and Health Act 1994 (OSHA), the setting up of the Department of Occupational Safety and Health (DOSH), and the establishment of the National Institute of Occupational Safety and Health (NIOSH). Industrial accidents at the workplace continue to be a grave concern to all of us. As we strive towards Vision 2020, it is inevitable that industrial and economic activities will increase. Activities in the manufacturing sectors, agricultural and service sectors will also be on the rise. There has always been a positive correlation between industrial activities and industrial accidents. We should not allow this trend to continue. 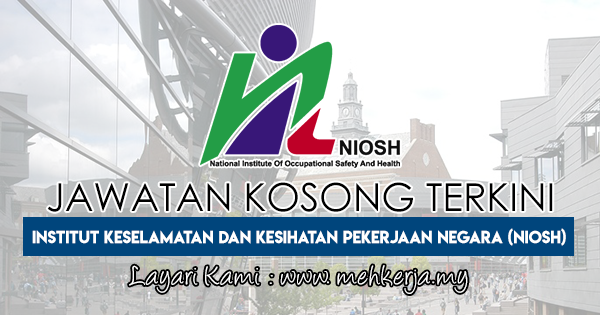 0 Response to "Jawatan Kosong Terkini di National Institute of Occupational Safety and Health (NIOSH) - 29 Aug 2018"